I had difficulty choosing between the electric and gas options that are offered for this model, but the fact that it is an Energy Star appliance (which means I know that it will do the best on energy that it possibly can regardless of the source) and that electric rates tend to be lower in my area and are expected to rise more slowly than the gas prices meant that I went with the electric option. I believe that the gas model is about $50 more, but if it is compensated for in your area by lower gas prices, then it might be worth looking into. I have had this model nearly a year, and I am very pleased with how easy it is to use, the dials move smoothly and accurately as well- this sounds a bit silly but it means that when I'm in a rush I don't accidentally put things on hot that are supposed to be warm. 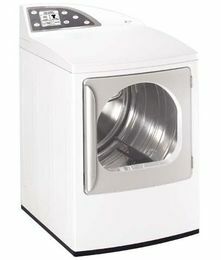 The tumble setting is excellent for getting wrinkles out of clothes. It has a very large drum, which is good as I have 3 children. Drying times are good, and even though it dries fast and therefore I am assuming it is powerful, it is very quiet- a plus to me because I find the noise of a dryer even when it is behind a door very annoying. This one doesn't bother me even when I am in the same room! Finally it comes with a drying rack- a nice plus if you have a lot of delicates that you would rather not tumble. I'd rec it to anyone who asked for a suggestion on buying a dryer. I have always had luck with GE products, and I learned a lesson with my dishwasher. I didn't go with GE and it was a mistake. Once again, I am very pleased with my choice. This machine is dependable, quiet, takes less time to dry than my old one, and has a drying rack! I didn't even know there was such a thing! I love it! No longer do the sneakers bang around the drum. It also has an anti-bacterial cycle. Now, I am not usually one for useless extras, but this is a nice option. I have dogs, and sometimes, it is nice knowing that the dryer has that feature. I like the side-opening door and the huge capacity. With my old machine, I often had to take the comforters to a Laundromat to use the industrial machine. No more! My wonderful new GE has a 7.3 cubic foot capacity and can take it. It dries more quickly than the industrial one. One other feature that I love is the extra-gentle cycle. I used to hang delicate items or roll them in a towel. This machine is very gentle and so far, nothing has been ruined. I paid approximately $800 for this machine, and feel it was money well-spent.